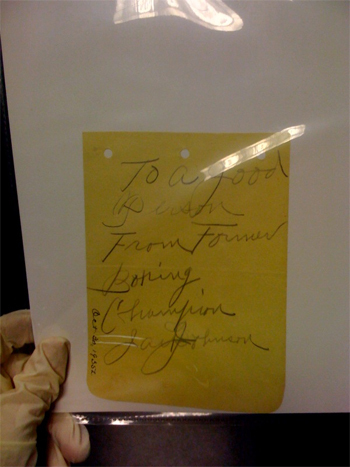 If you’ve been following our Brag Photo of the Week feature over the last week or two, you know that I busted into the vaults here and held a very unique group of four completely different historical autographs at once. Way too good to show all at once, so I’m revealing them one at a time. Last week, I showed you the Napoleon Bonaparte signature we had in house. For this week, it’s legendary boxing champion Jack Johnson. As was the case with Napoleon, Jack Johnson’s life was far too amazing and accomplished for me to try summing up here, so I’ll point you to the Wikipedia entry for your education. Johnson’s life was filled with remarkable athletic achievement in the face of blatant racism. We’re talking early 1900s here, so even Jackie Robinson shattering the color barrier was unheard of. I mean to be frank about it, Johnson won his first World Heavyweight title in 1908, a few months after the Cubs won the 1908 World Series. Ouch Cubbie fans, I really didn’t mean to rub salt into the wounds there. Was trying to show how long ago Johnson did his thing, and ended up pointing out your futility instead. I guess it’s universal like that. Want more context? Jackie Robinson wasn’t born until 1919. From a boxing history standpoint, Johnson was significant in that he used what’s standard strategy today in his fights, reacting to his opponent’s moves and striking when an opening was created. This “mental chess” aspect of the sport (often referred to as The Sweet Science) was still a new concept in boxing at the time (and helped elevate perceptions of it as time went on). Being a black athlete in the era, this smart strategy made Johnson a magnet for criticism and all kinds of racist commentary, but he racked up victories all the same. 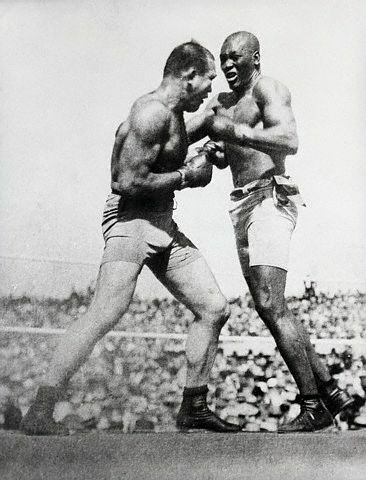 The above picture is from Johnson’s 1910 “Fight of the Century” against Jim Jeffries, which was culturally significant for America on a number of levels. Click here for a great summary by Ken Burns on the PBS website, and I’ll leave it up to you to decide if Ali vs. Frazier (another “Fight of the Century”) was bigger. And of course, this one will end up with a fortunate Upper Deck customer as well. I feel privileged to have held it, even if just for a few minutes. Next week, “a sinner”. Put in quotes, as to show the general perception by the public towards his profession, and not a reflection of my feelings in any way. I’m sure he was actually a kind person removed from that. It goes with the theme of “a saint” two weeks from now, is all. Please don’t hurt me. Brag Photo: Upper Deck Authenticated’s New ‘Iron’ Mike Tyson Memorabilia Packs a Punch! Liked the Blog. Great Read. Johnson does have a great story. Sounds like a great piece Miriam. The first thing you would want to do is send it to an authentication company like PSA/DNA so they can confirm the items authenticity. From there you should contact different auction houses to get a feel for the potential value of what it could bring at auction. Good luck!